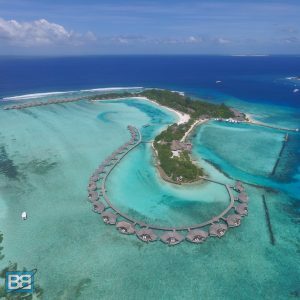 The Maldives is one of those bucket list destinations that everyone should try and visit once in their lives – and having visited there a few times now one of the first things people ask me is how much does the Maldives cost? It’s viewed by many people as a pretty high end, luxury, honeymoon destination and up until recently that was very much the case. 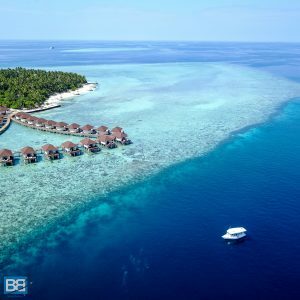 In recent years though this has begun to change and now the Maldives is a destination which can accommodate a huge range of travellers with all levels of budget – from local guest houses to 5* resorts. So if you’re planning a trip to the Maldives soon here’s my guide to how much to Maldives cost to travel, no matter what style of travel and level of luxury you’re after! FYI – All prices in this post are in $USD as the Maldives also uses this as a currency. The Maldives sits in the middle of the Indian Ocean – just below the coast of India and Sri Lanka. 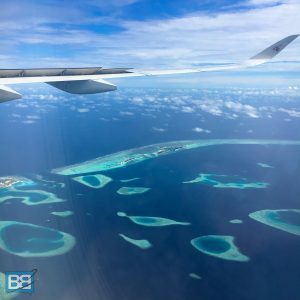 Despite being seemingly in the middle of nowhere the amount of tourism that it draw means that flying to the Maldives isn’t actually as pricey as you might think. Make Sure You Get A Window Seat! As well as stand alone return flights from Europe you can also easily package it into a bigger around the world flight ticket too – so a stop over en route to South East Asia or even Australia isn’t as complicated as you might think. Emirates – although in recent years Emirates have shot up in price I still use them a lot for multiple destination tickets and I nabbed a London > Maldives > Sri Lanka > Singapore > Australia flight all in for just over £600 one way. In fact adding in the stop to Sri Lanka and Singapore only added about £50 and I could stay as long as I wanted – so in theory I could’ve then bounced around South East Asia for a few month from Singapore. If you’re already in South East Asia then there are also some low cost airlines who fly to the Maldives, often under $150 each way once you’d added in luggage! Scoot – these guys fly direct from Singapore which is a great hub for the rest of Asia and onward international flights. The bottom line with flights is to check out sites like Skyscanner and ideally be flexible with your dates to nab the best fares. I also recommend signing up to sites such as I Know The Pilot and Secret Flying which will alert you to some awesome flight deals to the Maldives and elsewhere in the world too. One of the great things about travelling to the Maldives is that for myself (British Passport) visas are done on arrival and best of all FREE! Sometimes you’ll need to have proof of onward travel before you can board your flight, but that’s no big deal. In fact for a lot of countries tourist visas for Maldives are free on done on arrival – but as with all visas this varies from country to country so double check before you book your trip! 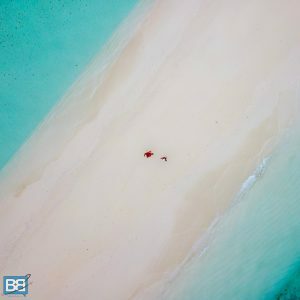 Up until recently the Maldives was pretty exclusive when it came to accommodation – with big hotel and private island resort holding a monopoly, which made it almost impossible to travel the Maldives on a budget without knowing a local! But in the last 5 years the government has relaxed the rules on locals owning guesthouses and a whole array of entrepreneurial Maldivians have opened up guest houses on a variety of island within the country – offering paradise at a fraction of the cost! 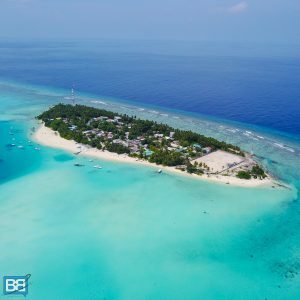 One of the best ways to find, book and manage your accommodation budget for the Maldives is through Air B N B (click here to get $33 of free travel credit too!) which is quickly becoming the booking platform of choice for the area. Islands such as Thulusdhoo, Maafushi and Fulidhoo seem to have sky rocketed in popularity as a result and you can now grab a private double room from $50 per night, with an average price of around $60. Yes that’s a bit more pricey than spots like Thailand or Cambodia – but it’s still cheaper than 2 dorm beds in Australia! And you’re in the freaking Maldives! Maafushi (South Male Atoll) – out of all the local island options this is certainly the most popular and easy option. It’s only a quick 30 minute speed boat from Male Airport and there’s a huge range of accommodation and food options for all budgets. There are plenty of mini day trips to check out too and it’s a favourite of fellow travel blogger Lauren from Never Ending Footsteps – you can check out her full Maafushi blog post here. Thulsdhoo – One Of My Favourite Surf Islands! Thulusdhoo (North Male Atoll) – my personal favourite just because of the amazing surf it offers up and there are some epic surf and stay package available on Thulusdhoo! For non surfers there are still plenty of accommodation options, snorkelling and good beaches to enjoy. The lagoon section is also full of baby shark swimming around which are super cute to watch! Ukulhas (North Ari Atoll) – this island is noted for its green island credentials and eco ethics, so kudos to them! This is also a great location for snorkelling with manta rays and they even have hammerhead shark diving here in the right season. 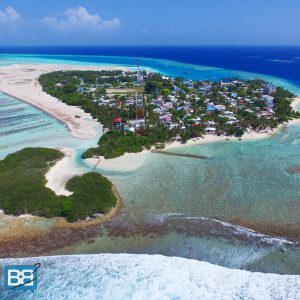 Himmasfushi (North Male Atoll) – another epic little surf island just 20 mins by speedboat from Male and home to famous surf spot Jailbreaks. It’s also one of the best budget surf destinations in the Maldives, with rates from around $65USD per room per night including breakfast and daily surf transfers (click here for more info)! For non surfers it offers much the same as Thulusdhoo – including snorkelling, resort trips and beaches. Beachfront With Busting The Budget! For those with a bit more cash to splash and who want a bit more luxury but without totally smashing your bank balance there are also some awesome mid range accommodation options throughout the Maldives. 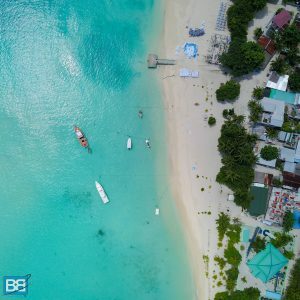 For local islands you can get some comfortable hotels for around $100-150 which will get you a pretty nice setup and all the amenities you’d expect from a hotel. Options such as Season Paradise on Thulusdhoo (around $90) Kinan Retreat on Fulidhoo (around $60 per night) The Barefoot Eco Hotel on Hanimaadhoo (around $100) are great examples of these. Keep an eye out on Booking.com for deals of the day and flash deals to nab yourself a bargain and also be aware that these prices will fluctuate with the seasons too! Cinnamon Dhonveli – Luxury Surfing! The other flip side of accommodation (and budget) is staying at a resort in the Maldives. Now when it comes to resort the sky is the limit with pricing – with spots like Velaa private island in the range of $2000 per night! The good news is that resorts come in a huge spread of budgets, so if you’re looking to go this route there’s plenty to choose from. However if you are looking to tick a stay at an over water bungalow in the Maldives off your bucket list you don’t have to have the bank account of a millionaire! Yes that’s not cheap, but it’s also not crazy expensive either, especially when you’re splitting that cost between two and not having to purchase and extra food or booze on top! Cinnamon have a few properties across the Maldives too with different styles and price tags but I can highly recommend them if you’re looking at going the resort route. If you want a whole heap more luxury I was also lucky enough to check out the absolutely stunning Anantara Dhigu Resort which is around $1500 for a Beach Bungalow or upwards of $2300 for an overwater bungalow. With that though you got access to all 3 of their island within a private lagoon which offered a range of restaurants to choose from (inc Italian, Thai and even Japanese), all connected by a water taxi as well as 2 ocean front bars (inc one for adults only…no kids allowed! ), an overwater spa and in-house diving centre. If you’re looking to splash the cash it’s certainly one I’d highly recommend! 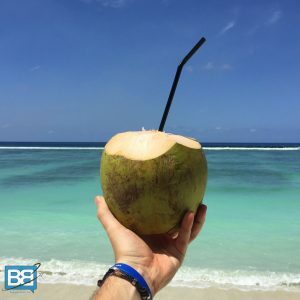 Cold Coconuts On The Beach – Doesn’t Get Much Better! Ok so this section is more aimed at those travelling on a budget, as if you’re staying at a resort most options are are inclusive, full board or at least half board. These resorts cater for a range of cuisines but it’s best to look into individual hotels for this info and pricing as everything varies heaps! For example in one resort I was paying $6 a beer and the same beer in another can be up to $15! One of the most pleasant things I found about traveling the Maldives on a budget though was how cheaply you could eat! Most guesthouses have a kitchen you can use and if you’re trying to keep the costs down this will help heaps! I was cooking curries, stir fried veggies and a variety of simply but tasty dishes for about $5 a meal shopping at local grocery shops. 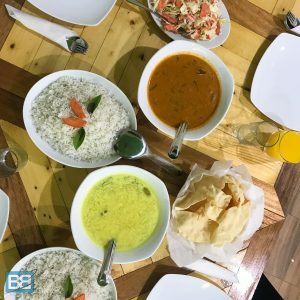 As everything in the Maldives is imported there isn’t a massive variety of stuff on offer and it can quickly run out – so you might end up visiting a couple to piece a meal together! Maldivian Food – Simple But Tasty! This was also very welcome because without double checking my dates I actually flew into the Maldives at the beginning of Ramadan on my first trip – a Muslim fasting holiday – so NO local restaurants were open during daylight hours! However, on my second trip I enjoyed eating out at local restaurants and it cost about $4-5 for a local style dish and up to about $10 for a more Western style meal. This price does vary quite a bit depending on the island you’re heading to though. Keep in mind that the Maldives is a Muslim country so you wont be able to buy alcohol on the local island OR bring in any duty free when you enter the country. So if you’re staying local don’t expect to kick back with a cocktail on the beach or hit up any beach bars. If however you’re staying at one of the resort you can buy alcohol and many offer all inclusive options so you can soak up the sunset with a cold beer! The price of alcohol at these resort (if you’re not all inclusive) varies from around $6 a beer to over $15 per beer, or $12 – $25 per cocktail. Also one INCREDIBLY frustrating thing to keep in mind is a lot of restaurants (and non all inclusive menus at luxury resorts) WONT include tax and government service charge – which will add 22% to your bill! Grab A Local Sim Card For Your Insta Shots! You’d think that being on a bunch of remote island would mean you’d be totally cut off from the world, well I was pleasantly surprised to discover that not only is mobile data pretty cheap in the Maldives, it’s also super reliable too! So you can easily Instagram your slice of paradise and make everyone jealous! …very handy for a digital nomad like myself, but maybe not so much if you want to disconnect from the outside world and relax! You can grab a local SIM card and pre load it with data just outside the arrival hall at the airport (come out and take a right). I picked up one from DhiMobile and got 14 days with 15GB of mobile data for $32. Just make sure your phone is unlocked before you fly to the Maldives and you’re good to go! Many guesthouses and resorts have wifi though, but if you need to stay connected its best to grab one before you leave Male, as you’ll have a much faster and reliable connection. If you’re not splashing your cash and getting private speedboats or seaplanes between islands you’ll need to start. My local ferry trip from Male to Thulusdhoo was 20MVR – approx $1.5 and took about 3 hours. Yes it wasn’t the most comfortable journey I’ve ever had (although to be honest I passed out for the majority of it!) but I’m not complaining at that price! To get from the airport to the ferry port was 22MVR (approx $1) – 10MVR for the airport to Male and then 12MVR to the ferry terminal. Quick local tip here – you can easily hitch rides to the ferry terminal for a lower price, which are often easy to get than a taxi. We ended up loading all our bags and my surfboard on to the back of someones pickup for this part of the trip! If you are going the resort route then speedboats and seaplanes are going to be the mode of transport you’ll be going with. 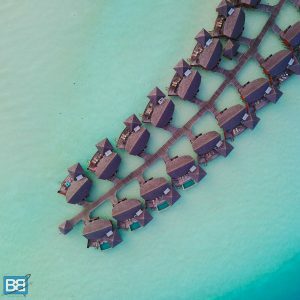 Now these can vary a lot depending on the location of your resort so when deciding on where to stay in the Maldives make sure you look into the transport costs for the resort as much as the room rate! 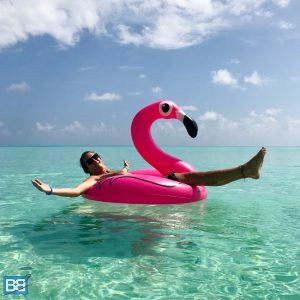 Speed boat is certainly the easiest and more budget friendly option, however if you’re staying a good distance from Male Airport then be prepared for a long boat ride and its well worth smashing some sea sickness tablets if boats aren’t your friend! The fastest option though is seaplane transfer, but these are going to set you back at least $300 return PER PERSON – so they aren’t light on the pocket. Still that will cut down a 90 minute speedboat transfer into a 25 minute scenic flight! Seaplane transfers – from $300 – $500+ return per person. Snorkelling With Manta Rays Is a Must! You might think the Maldives is all about lazing on beaches and soaking cup paradise – but in actual fact there’s quite a lot to do, especially for those who love the ocean! From world class surf breaks to breath taking scuba diving – so if you like your travels filled with stuff to do there’s no reason the Maldives cant offer you what you want! Quick Round Up How Much Does The Maldives Cost – The Expensive Bits! Quick Round Up How Much Does The Maldives Cost – The Budget Bits! Have you travelled to the Maldives? Any islands, resorts or tips you’d like to share?